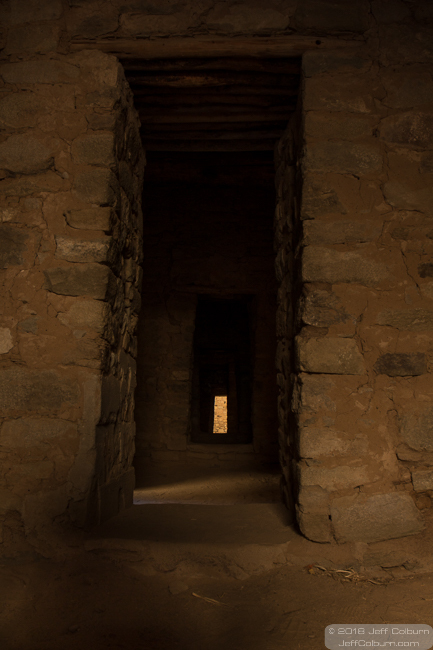 This is a great passageway at Aztec Pueblo, New Mexico. It was a warm day, but in the passageway it was wonderfully cool, with a great breeze. There are some openings on the left that lead to little courtyards, but they are covered with plexiglass so people won’t wander into them. It’s quite roomy here too, with plenty of clearance over my head. I really liked the Aztec Pueblo, and most of it is wheelchair accessible as they have asphalt walkways throughout. And when you visit the huge Kiva, be sure to press the button by the door that plays Native American singing. It creates an amazing experience.